3 Another angel, who had a golden censer, came and stood at the altar. He was given much incense to offer, with the prayers of all the saints, on the golden altar before the throne. 4 The smoke of the incense, together with the prayers of the saints, went up before God from the angel’s hand. The figure on the throne is the source of light in this scene. The lamb that was slain (on the knee of the figure on the throne). Around the throne are the 4 living creatures. an angel holding a golden censer is standing by the golden altar, by the foot of the stairs leading up to the throne. 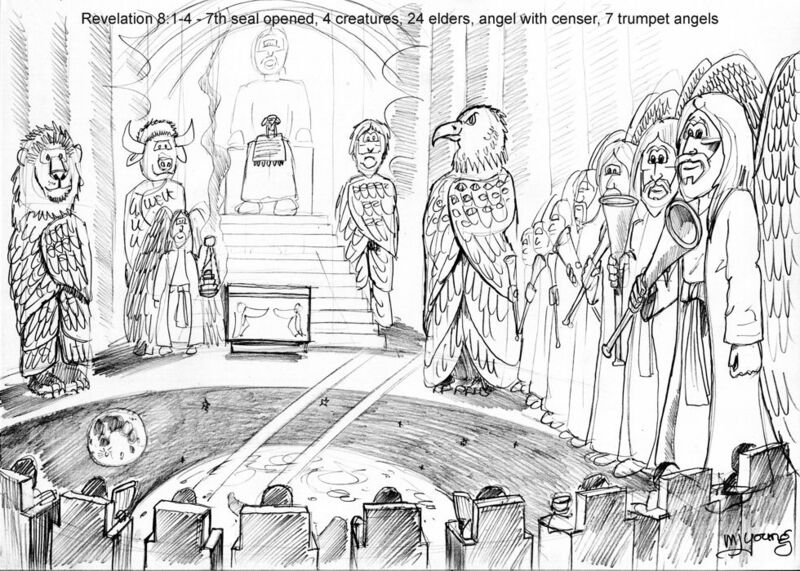 7 angels with trumpets (only 6 trumpets are visible in this scene) stand to the right of the scene. 9 (of the 24) elders are seated on thrones, in the foreground of the picture, with their backs to the viewer. This scene has taken me days to complete! It is one of the most complicated scenes I have drawn all year… possibly ever! 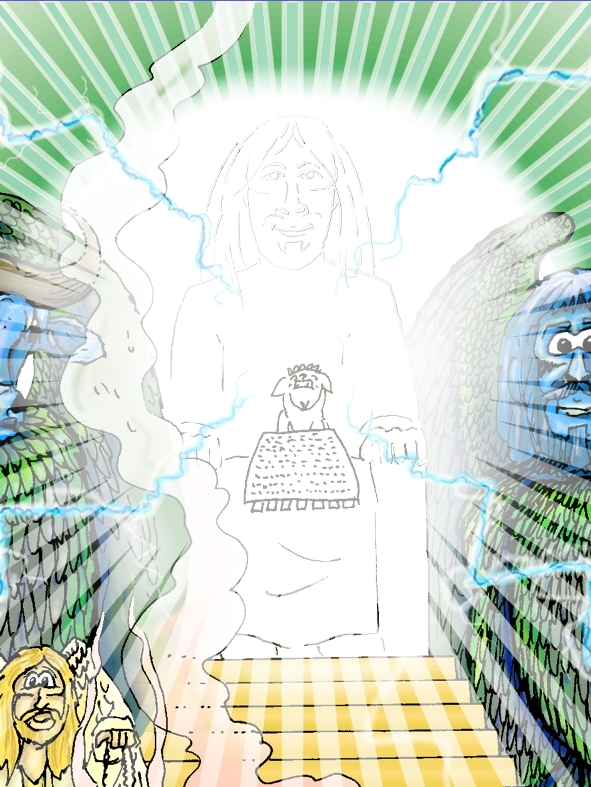 I toyed with the idea of entitling it “… Scene 02 – Throne room”, but that didn’t really fit in with the narrative flow, especially as the next verse has the angel throwing the golden censer to earth. Although this part of the narrative focusses primarily on the angel with the censer, he is rather upstaged by the other figures in the scene! 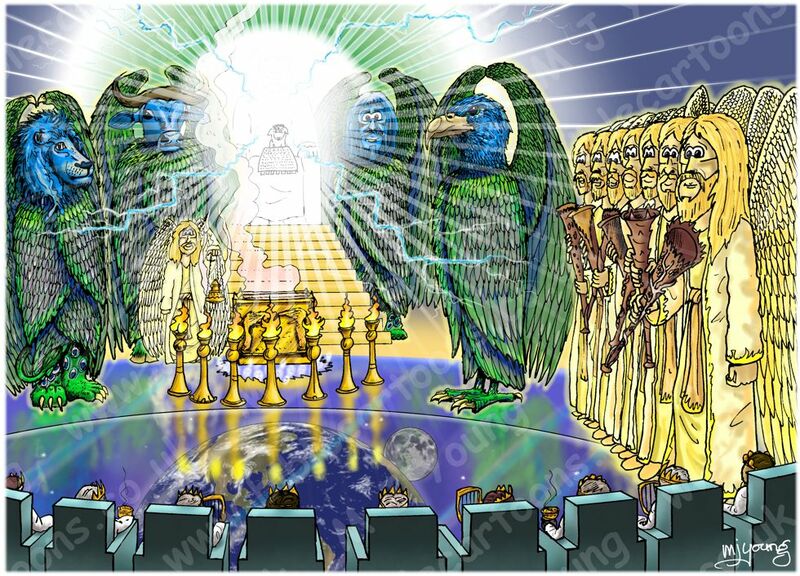 Certainly the 4 living creatures, the 7 angels with trumpets and the central figure on the throne are all larger and grander-looking than the angel with the golden censer! I hope he doesn’t feel lost amongst heaven’s finest! 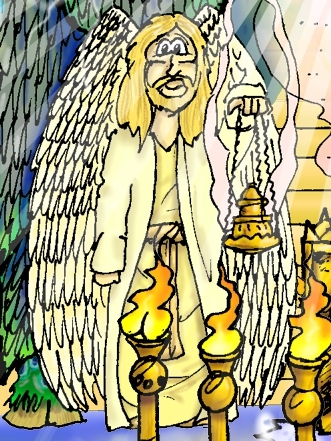 Even though the focus is on the angel with the censer, this scene includes many elements described in other parts of the Revelation narrative. Below are Bible quotes and my notes regarding each major element of this scene, with some close-up views to help describe the element. Here’s the initial greyscale pencil sketch of this cartoon. The figure on the throne. 2 At once I was in the Spirit, and there before me was a throne in heaven with someone sitting on it. 3 And the one who sat there had the appearance of jasper and carnelian. A rainbow, resembling an emerald, encircled the throne…5 From the throne came flashes of lightning, rumblings and peals of thunder. Before the throne, seven lamps were blazing. These are the seven spirits  of God. Close-up of the figure on the throne, with more detail showing of the features than appears in the image files customers download. NOTES: The description of God sitting on the throne of heaven is amazing. I decided to illustrate Him as in the centre of a dazzling white light, with the emerald rainbow encircling Him, and lightning flashes radiating from Him. I decided to have steps leading up from the “sea of glass” to the throne of God. There is also an altar (see notes below) and 7 lamp stands before the steps. The 24 elders on thrones. Each one had a harp and they were holding golden bowls full of incense, which are the prayers of the saints. NOTES: I decided not to show all 24 elders, but have included a few in am arc in the foreground of this scene. Hopefully the arc gives the sense that the rest of the elders are off to the left and right of the picture. 6 Also before the throne there was what looked like a sea of glass, clear as crystal. NOTES: I wondered if the “sea of glass” material might allow the beings in heaven to look down upon the earth, through it. I have shown a space scene, with the earth and moon prominent among the stars in my picture. Note the reflections of the figures, the altar and 7 lamp stands on the surface of the “sea of glass”. It’s these reflections that make it look transparent, like glass. Here’s the initial greyscale pencil sketch of the lion-headed living creature. 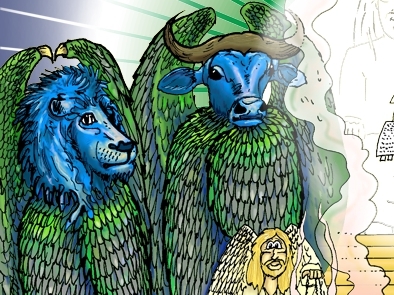 Close-up of two of the living creatures, one with the head of a lion, one with the head of an ox. 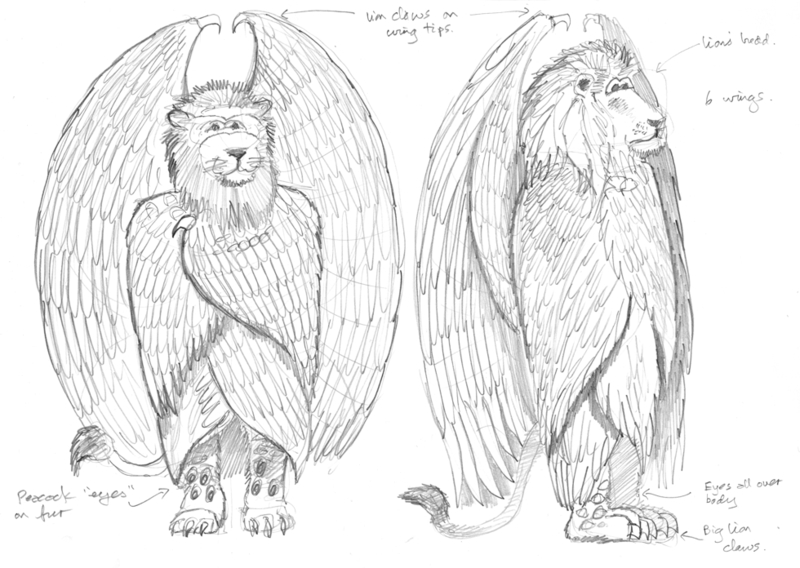 NOTES: I decided to show the 4 living creatures as being wrapped in 2 pairs of their wings, with the 3rd pair behind them, encircling them. I have kept the order of the creatures as it appears in the Bible; the first (left most) creature is the lion one, with the ox-headed one on the left of the throne. 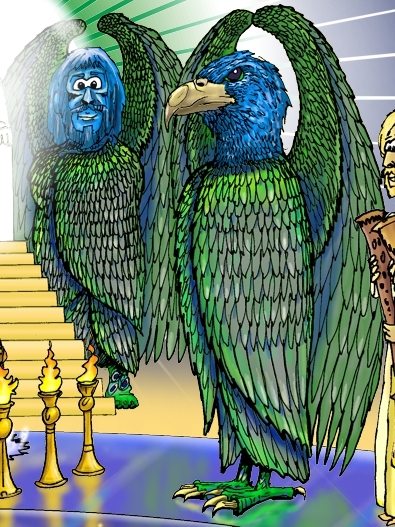 Then the living creature with the head of a man stands to the right of the throne, with the eagle-headed one to the right again. 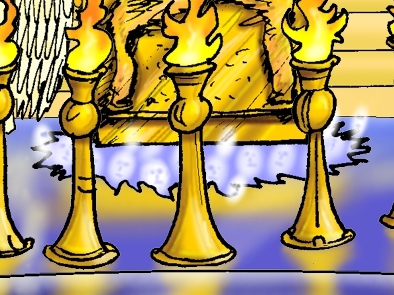 Although the Bible states that the 4 living creatures were “around” the throne, that is rather difficult to show in my Bible Cartoon, as the light and lightning coming from the throne would obscure the back two. For this reason I have slightly altered their position, so they are more “beside” the throne. Close-up of two of the living creatures, one with the head of a man, one with the head of an eagle. The description of the 4 living creatures says they are covered in eyes. I decided to illustrate my version of the 4 living creatures based on a Peacock’s fantastic, bright feather colouring, using the “eye” design of a Peacock’s long tail feathers as the “eyes” mentioned in the description of the 4 living creatures. Peacock’s have bright blue necks, which I have carried into the colour of the heads of the creatures in my scene. The bright green of the creature’s legs and feet comes from the emerald green of a peacock’s feathers, on it’s back. The scroll with seven seals. NOTES: In this scene it is almost impossible to see the 7 sealed scroll, due to the glow from the figure on the throne! The scroll is open, on the lap of the figure on the throne. 6 Then I saw a Lamb, looking as if it had been slain, standing in the centre of the throne, encircled by the four living creatures and the elders. He had seven horns and seven eyes, which are the seven spirits  of God sent out into all the earth. 7 He came and took the scroll from the right hand of him who sat on the throne. NOTES: The lamb that was slain is in the centre of the picture, standing on the lap of the figure on the throne, with the 7 sealed scroll before the lamb. The altar before the throne of God. NOTES: As mentioned above, the alter stands before the steps, that lead up to the throne of God. We know from Revelation 9:13 that the altar has gold, and had horns. We know that the altar of burnt offering which Moses had made for the tabernacle (see Exodus 27:1-8) also had horns at the 4 corners. I expect it was a reflection of the design of the altar that is in heaven. I decided to put a bas relief pattern of 2 cherubim on the altar, reminiscent of the cherubim on the atonement cover on top of the ark of the covenant that Moses had made for the tabernacle (see Exodus 25:10-22). Close-up of the souls under the altar. How was I going to show “under the altar the souls of those who had been slain”?! I decided to show a patch of ragged edged purple cloth, beneath the altar, with faint white figures in and around it. The seven angels with seven trumpets. 1 When he opened the seventh seal, there was silence in heaven for about half an hour. 2 And I saw the seven angels who stand before God, and to them were given seven trumpets. NOTES: I wanted the 2 trumpet angels to be tall and imposing. Each has an outer robe with a fiery pattern on its edge. Notice that each of the trumpets has a different design, which relates to the different effect each one has on the earth. The angel with the golden censer. Close-up of the angel with the golden censer, standing beside the altar. 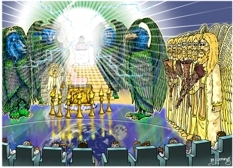 The angel with the golden censer is designed in very similar terms to the ones on the right of the scene, and the ones shown in other scenes I have illustrated showing angels, throughout the Bible.